Submitted by Norm Roulet on Thu, 04/22/2010 - 11:06. I was doing some research on lead paint on toys - still a huge problem in America and world-wide, as the lead industry keeps expanding - and I thought about all the lead American children were exposed to growing up in my generation, and the generations before me, during the foolish industrial era in America. Consider the harm caused to us - older Gen-X, Baby Boomers, down through "The Greatest Generation" - the greatest price for which is still to be paid in healthcare-costs, pain and suffering for industrially-impaired older adults and senior citizens suffering for such socially-irresponsible behavior as chewing their pencils in school, as kids. Never mind that corrupt industry monopolies and their evil politicians forced lead poisoning on nearly every man, woman and child in America, throughout centuries here and especially in the 1900s, until the late 1970s... making much of the nation a toxic brownfield... it is "your" fault. A wonderful example of the evil of the lead and paint industry and their cohorts, still prosperous and globally active world-wide today (ever hear of a lead industry executive being sued or going to jail for killing 1,000,000s??? ), is found studying lead poisoning from "lead" pencils used by most school children until lead paint was outlawed, in the late 1970s. The harm was not from the graphite core, which never contained lead, but from the usually-yellow paint on the outside, which seems to always have contained lead for as long as most American adults in their mid-40s and older today were of pencil-chewing age... from birth into college. 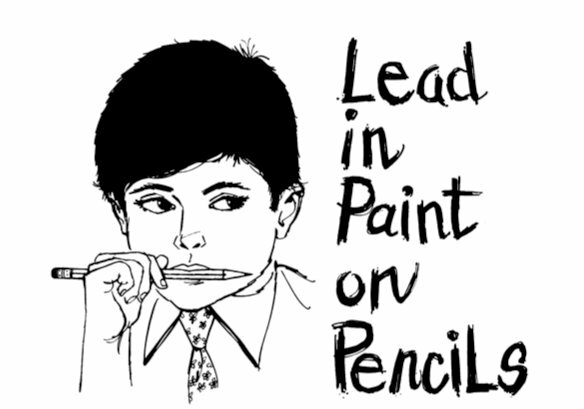 While harm from physical contact with lead pencil paint would have been minimal, harm from chewing pencils and ingesting paint could be fatal - small amounts of lead harmed all who chewed pencils coated in lead, which were most pencils in America through the late 1970s. Most kids who chewed pencils did so because lead paint is "sweet" and tastes good to children, so kids who developed an appetite for that ate lots of lead paint, usually daily. Ouch - that stuff breaks down in your digestive system and stays in your body forever. Gee... wonder where things like breast cancer come from? Just my wild guess, but it seems cellular mutation from generations of Americans (and other select global populations) eating grams of lead may be a factor...?!?! I found a 1971 study of the lead pencil chewing issue which concluded paint on all pencils tested from a random sample then had some lead, and some samples had very high levels of lead - all the pencils tested would harm those who chewed them and ingested the paint. The study also references a "Pencil Makers Association", which represented manufacturers of 90% of the pencils in America at the time. Lead poisoning of children and in fact all Americans was not a disorganized, random act. Those harmed include 1,000,000s of Americans alive and leading the nation today - while suffering the consequences of lead poisoning - and needing specialized medical treatment not recognized today, as they die from toxification now and in the future. I do not know of any research in America or the world considering how such lead exposure among most youths of the past will play out in their dying in old age today - we don't even really study the impact of early-life lead poisoning on we the lead poisoned people during mid-life... now! We don't study or talk about this as a society today because we are too lead poisoned... and the businesses that poisoned us are still prosperous today (wouldn't want to hurt their executives and shareholders), and industrial America and our lead poisoned leaders remain in denial of the real harm their industrial contamination has caused American citizens, and our global competitiveness... largely thanks to collusion with the corrupt medical industry. Those not in denial understand the realities about lead poisoning all too well. Most adult Americans have been lead poisoned in many ways, and made the fools. Now, watch how un-funny is the suffering from this as we die. Eventually, Americans may stop denying why we've suffered so long, so much. Will it be too late for you? Will it be too late for our children? America is still one of the leading lead production nations in the world, and our nation's leadership still allows millions of children and adults in America and worldwide to be lead poisoned each year. Most of those lead poisonings would be preventable, with competent, honest, non-lead poisoned global leadership. Obama... did you chew your pencils growing up? We need to find new, younger leaders who are not lead poisoned, and keep them clean... that is the only hope for America now. "They", the industrially-informed, knew about the harm lead poisoning caused Americans long before the 1970s... but "We" the people were near-universally poisoned none-the-less, in our schools, and have been kept stupid since by the same corrupt industrial machine leadership who poisoned us. The industrialists and their families certainly knew to avoid all sources of lead... neat way to build a super-race, huh?!?! No messy gas chambers. Lead makes you stupid - connecting the dots?!?!? Why would "They" do this to us? Ask your father, if he isn't too lead-dumb, and hasn't already died of America-poisoning. Read what industry and science knew about "Them" poisoning us - their children - in 1971, linked here.